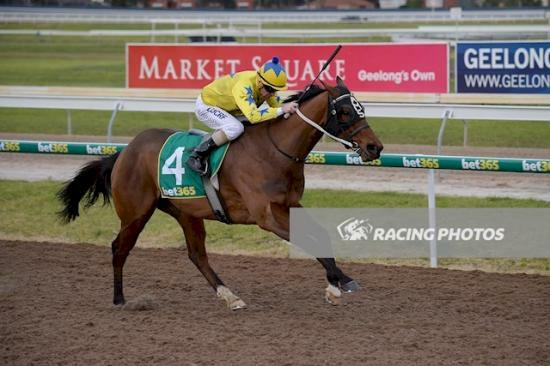 The stable's great run continued at Geelong last Friday, the gutsy galloper Sergeant Hightower stepping up to benchmark 64 level having finished in the first two at each of his four previous starts in slightly easier company. Jumping fast from the inside gate, the talented bay took a sit fourth on the rails, travelling sweetly for regular rider Brian Higgins. Hooking out three wide into the straight, Sergeant Hightower wore down the leaders who had given a kick at the turn and from the 100m he was able to get away from them, saluting by a soft 2 1/4 lengths. "We ended up in a good spot and had a breezy run," Higgins reported, adding that Sergeant Hightower has really turned the corner in recent times. "He used to make his run and worry himself out of it but he is racing with confidence now and really hitting the line." "He is flying!" she enthused, "and it is no surprise to see him measure up to this grade." "The 1000m to 1200m is ideal for him," she added. "He had a few niggling issues early but his owners have been patient and they are now reaping the rewards." Bred in northern Victoria by Greta West Stud, Sergeant Hightower is a son of Danehill's Bill Stutt Stakes winner Churchill Downs and the winning Marauding mare Firhill. Also dam of the city winners Purple Storm and Two Hills, Firhill did not get in foal last spring but has a yearling filly by the Magic Millions winner Unencumbered. Sergeant Hightower has now won five of his 26 starts, amassing over $112,000 in stakes.